2.6m (can be cut into 3 sections of 86cm). Baby Boy party banner - celebrate the new arrival of your bundle of joy by placing these banners in your window, around your house etc. 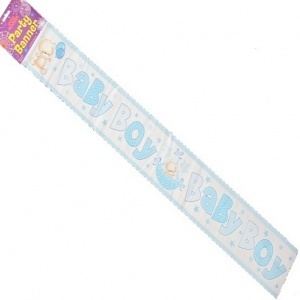 Can be used as one long length or easily cut into 3 design lengths for smaller banners. Beautiful design in blue and white. Brand new complete in sealed packaging with tags.